Javier Morales Martinez, age 17, is currently a senior at the Los Angeles County High School for the Arts. Javier is attending the University of Southern California in the fall of 2018. He is a recipient of a Herbert Zipper Scholarship at the Colburn Community School of Performing Arts, where he has been a student since 2013. Javier studies clarinet with Michael Yoshimi and music theory with Kathy Sawada. He is principal clarinet of the Colburn Youth Orchestra directed by Maxim Eshkenazy and the Wind Ensemble directed by Darren Mulder. 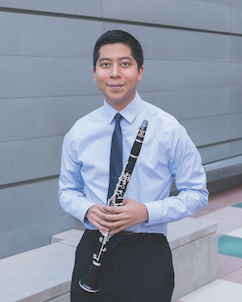 In 2017, Javier won second prize at the Backun International Clarinet Competition, first prize in the Mondavi Center Young Artists National Competition, second prize in the International Clarinet Association’s High School Solo Competition, a merit award in the National YoungArts Awards, Honorable Mention in The Music Center’s Spotlight Awards, and appeared on NPR’s nationally broadcast program, From the Top, where he was awarded the Jack Kent Cooke Scholarship. And in 2015 he was a winner of the Michele Zukovsky Clarinet Competition. Most recently, he has been named a semifinalist in The Music Center’s Spotlight Awards and his trio has advanced to the semifinal round of the Fischoff National Chamber Music Competition, as well as M-Prize, University of Michigan’s international chamber arts competition. Javier was awarded the Emerson Scholarship in the summer of 2015 to attend the Interlochen Center for the Arts, has attended Boston University’s Tanglewood Institute, and has been a recipient of the Young Musician’s Foundation’s David Weiss Memorial Scholarship. Amy Sze, 16, began playing the violin at the age of 3 and now studies with Aimée Kreston at the Colburn School where she is the recipient of the Richard D. Colburn Scholarship Award. She is an entering 11th grader at the Crossroads School for Arts and Sciences in Santa Monica where she is the recipient of their EMMI music studies scholarship. Amy was recently a semifinalist of the triennial Stradivarius International Violin Competition held in Salt Lake City. She is also a 1st prize winner of the Classics Alive Young Artists National Auditions, recipient of the Chamber Music Award and 1st prize of the Palisades Symphony Concerto Competition, 1st prize winner in her division of the Gail Newby Concerto Competition, and Gold Medalist of the Montecito International Music Festival Concerto Competition. As a member of the Fuoco String Quartet coached by Andrew Cook and Aimée Kreston, she was a semifinalist of the University of Michigan’s International M-Prize Chamber Music Competition and a bronze medalist of the National Chamber Music Competition of the Pasadena Conservatory. Cecilia McIntyre age 13. Cecilia loves all things musical - especially playing violin and piano. Cecilia began studying violin when she was 4 1/2, first with the Pasadena Step Program and currently at Pasadena Conservatory of Music where she also is part of the Chamber Music Program. She is a member of the Colburn String Orchestra. Cecilia enjoys playing all kinds of music from Mozart to Mendelssohn and now and again an Irish fiddle tune. Cecilia is thrilled to be participating in the Eastern Sierra Symphony in beautiful Mammoth Lakes. Cellist Naoya Kanai is a native of the San Francisco Bay Area. He received a B.A. in Human Biology from Stanford University, where he studied with Christopher Costanza and the St. Lawrence String Quartet, and a M.M. from The Juilliard School, where he studied with Fred Sherry. An alumnus of the San Francisco Symphony Youth Orchestra, Naoya has performed in Banff, Aspen, Orford, and Takefu, as well as at the New York String Orchestra Seminar. In addition to performing throughout Northern California, he works at Airbnb as a data scientist. Deanna Badizadegan is a San Francisco-based violist with two engineering degrees from Stanford and a diploma from the San Francisco Conservatory of Music. She currently enjoys a busy freelance schedule in the Bay Area, performing with members of the San Francisco Symphony, San Francisco Conservatory, and Classical Revolution, among others. As a soloist and chamber musician, she has recently performed at TEDxStanford, TEDxFargo, the Berkeley Symphony Chamber Series, and the Maybeck Studio for the Performing Arts. In addition to performing, Deanna enjoys working with the Stanford Technology Ventures Program and the 21st Century Musician Initiative to bring more entrepreneurial ideas into the arts. This fall, Deanna will begin graduate studies at the New England Conservatory of Music under the tutelage of Kim Kashkashian. Scarlett Chen, age 13, has been playing the violin since age 8 and the piano since age 4. By age 10, the Jack Kent Cooke Foundation awarded Scarlett with the Herbert Zipper Scholarship, providing private lessons for both instruments, theory classes, participation in chamber ensembles and orchestra, and providing a high-quality violin, all at the Colburn School of Performing Arts. Because of this scholarship, Scarlett has been studying the violin with Aimee Kreston and piano with Jee Sung Kang since 2013. Scarlett has participated in many summer camps and festivals around California which include performing in the Eastern Sierra Symphony at the Sierra Summer Festival under Maestro Edwin Outwater. She has also participated in a side by side program with LA Opera musicians for the production of Daniel under the baton of Maestro James Conlon. Scarlett has played at numerous Friday Night Recitals and School Recitals at the Colburn School. She recently received honorable mention in the finals of the 2017 ASTA Competition. Whether it’s the tambourine, snare drum, mallets, triangle, or timpani, Eli loves it all! He is very grateful to be participating in the Eastern Sierra Symphony this summer. Eli attends high school at the Interlcohen Arts Academy where he studies with Keith Aleo. When home in Los Angeles, Eli studies with Matt Howard. Prior to going to Interlochen as a Freshman in 2016, Eli was a member of the Colburn Youth Orchestra under the direction of Maxim Eshkenazy. A few of Eli’s favorite pieces that he has recently performed include The Flute Concerto by Christopher Rouse, Nocturama by Gabriel Kahane, Three Places in New England by Charles Ives, And The Mountains Rising Nowhere by Joseph Schwatner and Dark Full Ride by Julia Wolfe. Andrés Engleman became interested in the violin at the age of 3, and after two years of asking his parents “am I old enough yet?” began taking violin classes at 5. He has played for several orchestras and small ensemble groups, appearing in venues such as the Japanese American Cultural & Community Center, the PBS Holiday Celebration, and Carnegie Hall. He regularly shares his music with others by busking on the street, and donates his earnings to worthy causes. To date, he has donated more than $1,200 to St. Jude Children’s Hospital and Best Friends dog sanctuary. He is currently studying with Aimee Kreston at the Colburn School. Anna Yoo is 11 years old and is excited to play her third season alongside and learning from the professionals of the Eastern Sierra Symphony. Anna is a talented pianist and won prizes during the past year at CAPMT Contemporary Music competition state finals, SYMF competition, MTAC theme festival, and CAPMT District iii Sonata/Sonatina competition. 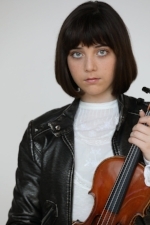 In violin, this past year, Anna was a prize winner at CAPMT Southern California Concerto Competition (runner up/alternate), ASTA Los Angeles finals (honorable mention) and first place winner at Satori Prodigy Solo and Open Bach competitions. Anna is grateful for the support and guidance of her music teachers, Aimee Kreston and Roza Yoder, and also for the generous support of the Pasadena Conservatory of Music. Eddie started to study violin with Ms. Aimee Kreston with the recommendation of his first violin teacher Mary Kelly. Ever since, he has enjoyed many opportunities to play chamber music, orchestral music and a concerto with orchestra. Eddie is a member of children’s chorus singing with LA Opera in La Boheme, Tosca and upcoming Carmen. Eddie is also a very skilled soccer player, an enthusiastic baseball fan, and an absolute foodie. Albert studies violin with Ms. Aimee Kreston and viola with Mr. Andrew Picken. His chamber group Canto Quartet was one of the semifinalists in Pasadena Conservatory of Music Chamber Music Competition. Growing up, Albert has always enjoyed music. He played recorder as a little kid and clarinet in school band. He is a member of Los Angeles Children’s Chorus and Colburn Youth Orchestra. Albert is also a competitive swimmer.